When I was little and didn’t finish my dinner, my parents would tell me about the starving children in India. I would push my plate away and petulantly exclaim, “Put this in an envelope and mail it to them!” I shudder to think of it and marvel at how far I’ve come. It sounds cliche to speak of starving children in the developing world. But you see, I was born in India. My parents immigrated to the United States when I was a toddler. Hungry children in India isn’t merely a nebulous concept, it’s a reality my parents knew firsthand. Mind you, they did not grow up impoverished. But my family saw abject poverty daily. It’s impossible to miss if you visit India or any part of the developing world. The West tends to focus on hungry children in developing countries. The image of gaunt kids with distended bellies is an easy notion to conjure up. It evokes pity, sadness, but rarely, I venture to guess, action. Yet these images are far removed from our own American paradigm. You see, if we as a society continue to perpetuate stereotypes, the face of hunger is one that does not look like us. It’s easier to ignore, just tucked away into the crevices of our mind that hold those uncomfortable bits of information that we’d rather not face. Yet in America, in our own communities, hunger lurks. The face of hunger looks just like yours and mine. For those who step out of their bubbles, comfort zones, call it what you will, this comes as no surprise. Ask any teacher about food insecurity and childhood hunger. They can wax poetically of what they see every single day in every zip code across our state. I volunteer with children whose only meals are at school because they get free or reduced lunch. This colors my summer and snow days because I am left thinking of these children while my own sons indulge in hearty homemade goodness. Thankfully, there are people who work tirelessly to feed children and families in need. On snow days many teachers risk their own safety to deliver meals to families. Neighbors help neighbors. And the staff and volunteers of the Food Bank go in overdrive during the days and hours preceding a storm to ensure families can be fed. I serve as a Social Media Ambassador for the Food Bank. My job is easy. I use my voice to share why it’s important to support families in crisis in our community. Food is a large part of my family life. I love to cook, and my family loves to eat. It’s as simple as that. We plan our vacations around food and restaurants we want to try. I’m fortunate to have sons who are adventurous, healthy eaters. We want for nothing so it’s important to me that my children grow up with a sense of gratitude and volunteer spirit. More importantly, I want them to know that their words and actions make a difference. The boys have helped pack food at the Food Bank and know that though they are young, they can still make a difference. Our volunteer work as a family isn’t for accolades or out of pity or some sense of guilt. We serve because that’s what being part of a community means. I tell my sons that what we take for granted is commensurate to what we give back. Supporting the Food Bank feeds my soul. The Food Bank does more than feed bellies; it nourishes our community. 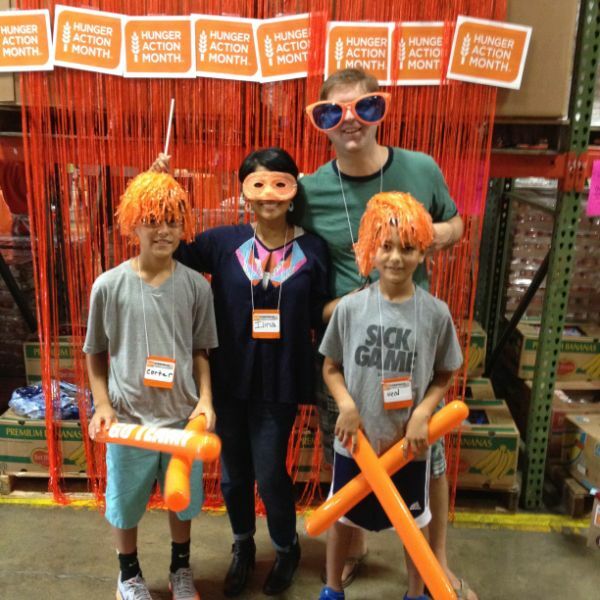 Ilina and her family volunteer during Hunger Action Month at the Food Bank in Raleigh. April 10 – 16 is National Volunteer Appreciation Week. We celebrate and applaud all of our volunteers who sort food, collect donations, and raise awareness like Ilina. To learn more about or join our Social Media Ambassador Program, visit our website. To read stories of more volunteers, follow us on Instagram. April 12, 2016 in Volunteer.